Information to our newsroom is that the supply of diesel fuel is running very low. In fact going into the weekend, gas stations are receiving only a limited amount and in some cases, they are rationed to a thousand gallons, which is less than the demand in normal circumstances. Diesel is sourced from PUMA and there are two tankers with diesel and regular gasoline already in country, but from what we are told, they are waiting for clearance to unload. Pass the weekend; the shortage could become more acute. One unconfirmed report is that PUMA cannot receive any fuel because G.O.B. has not paid outstanding bills. The Ministry of Finance did not offer any comments today. It has come to the attention of the Government of Belize (GOB) that a temporary delay in the replenishment of the supply of diesel oil, which has led to some gas stations not receiving their full orders, is somehow being attributed to a purported non-payment by Government of its fuel bills. The Ministry of Finance wishes to advise the public that this delay is solely due to unanticipated difficulties encountered by PDVSA, not by PUMA or the GOB, in the offloading of a shipment of fuel from Venezuela to Belize, and has absolutely nothing to do with any payment by GOB of its fuel bill. All GOB bills are, and are expected to remain, up to date. The Ministry of Finance has been informed by PUMA that it is has made alternate arrangements to bring in diesel fuel from other sources to fill the full needs of the gas stations. The stock of diesel will return to normal no later than the middle of this week. It is also expected that the shipment of fuel from Venezuela will be offloaded in the next several days. In the meantime, diesel is available at stations countrywide. 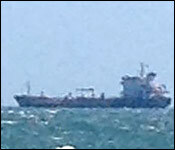 And a story that dovetailed perfectly with all this talk of budgetary panic is the news that an oil tanker named "Syrtos" has been anchored off the coast of Belize since last week Wednesday. The tanker, with thirty eight thousand barrels of fuel from the PDVSA refinery in Curacao because the ship's owner hasn't been paid. The way the story was put out by certain media outlets was that government can't come up with the money to pay - and that fit right in with the Joe Waight panic memo. But, a neat fit doesn't always make for good facts - and in this case, that story is inaccurate. Indeed, there is an oil tanker parked off the Belize City coast which hasn't been paid - but it's PDVSA in Venezuela who hasn't paid them - and it has nothing to do with Belize. The fact is PDVSA has been sanctioned by the Trump Administration - and does not have access to International Banks because of this - which is most likely the cause of their inability to make a payment transfer. "It is PUMA who is responsible for supplying fuel to the entire market of Belize. PUMA sources from APBEL but also get its fuel from other sources. You are seeing trucks coming over land coming from Guatemala. Puma is currently sources regular gasoline from Guatemala. Their ship that is bringing in premium and regular is coming in between Friday and Saturday of this week." "Since you all source it from PDVSA in Curacao, you all are responsible for the ship which is down in the habour and is unable to offload?" "PUMA places its order with its trader Trafigura. Trafigura is who goes out there looking for fuel for PUMA. PUMA is local importer and traficgura is the trader for PUMA. Traficgura they then place order with APBEL. It also places orders with other suppliers. APBEL is the joint venture here which then places its order with PDVSA. They then deliver the fuel to traficgura/APBEL/PUMA. But of course it's one ship that goes from Curacao directly to the port here. What happened here is that PDVSA contracts vessels to carry the load. In this case, and it has happened before, the ship has come but put on financial hold. Meaning that there's been a breakdown somewhere most likely because PDVSA has been able to pay the vessel's owners. It doesn't mean that they ran out of money, it could mean the US sanctions or something like that. They have been unable to satisfy the vessel owners. That they have made whatever payments that were due to them and as a result the vessel's owners are saying hold on were not going to offload until you pay. It is a situation between PDVSA and vessel's owners. This is not the first time that this has happened. People are saying the government is somehow responsible for paying the ship. The government of Belize is not involved in this at all." "Yes but APBEL is a represented, a joint venture between the government of Belize and the government of Venezuela. So then the feeling could be that APBEL hasn't paid these people and so these people can't say these people." "Oh no. of course that's not it." And while it is PDVSA who must pay the ship - the question is, has APBEL - which is part owned by the government - have they been paying PDVSA? That's the Petrocaribe arrangement where government gets about 60% of the fuel's cost on low interest credit and pays the other. Mencias explained that indeed, the payments are backed up but not because government doesn't have the money - but again, because of the US banking sanctions against Venezuela:..
"So now its APBEL up to date on the payments which are very important to PDVSA?" "Yes. What has happened because of the US sanctions. APBEL has been unable to transfer money to PDVSA. But the monies have remained here and we're arranging an escrow account for it to set aside in the escrow account for PDVSA whenever they are able to transfer it to them. What I am saying is not that APBEL has been unable to transfer the money to PDVSA that they have run short. We are a small little drop in a bucket. If we are unable to transfer payments due to the US sanctions, that would not have this effect." "How much is in this escrow account?" 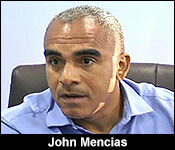 John Mencias "In the escrow account that is being set up about 8.9 million US dollars." Mencias says DIESEL AND KEROSENE fuel arrived into PUMA through its own sources on Saturday, and the SHIPMENT WITH PREMIUM AND REGULAR COMING ON FRIDAY. And, as you saw, fuel has also come by road from Guatemala. The Syrtos will eventually be paid by PDVSA and offload in Belize.